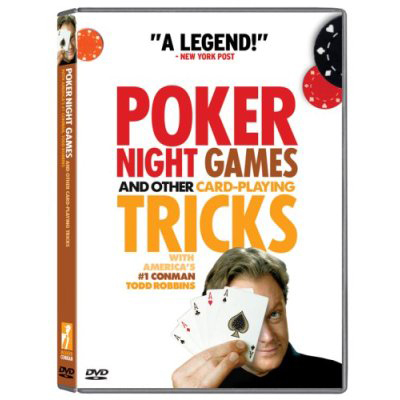 America’s #1 Conman, Todd Robbins, is finally sharing some of his cons and playful scams from his DVD “Poker Night Games and Other Card Playing Tricks” which features over an hour of how-to material including dozens of scams, bets, and tricks designed to help people win a few extra bucks from buddies at the poker table. They’re also a great way to make some new friends along the way. When done for fun, players get a kick out of getting tricked, knowing full well they’ve just learned a new way to sucker someone else the next time! As a close-out, there are limited quantities at bargain price. Contact stores@altavoz.com or 301-95MUSIC for details. In Poker-night Games and Other Card-Playing Tricks bonus material includes: extra cons, such as PENCILS and NO-ASH SMOKES, tips on spotting cheats, and crazy-but-true poker trivia. Todd Robbins, the master of the late-night swindle, has been seen on THE TONIGHT SHOW, DAVID LETTERMAN, and CONAN O’BRIEN, and has performed everywhere from Carnegie Hall to the Sideshows of Coney Island. Recently, Todd appeared on the A&E series MINDFREAK and on the History Channel where he taught David Carradine about vices in the Old West.